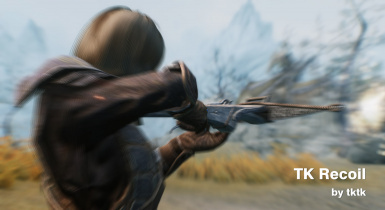 When the player shot a bow or crossbow or staff, a "recoil" (a tiny pause) is added along with camera shake and blur effects. This makes weapon recoil feel more solid and heightens the sense that a hit has actually been made. This mod don't add a animation. 2018.04.12 Supported Spanish and French language. 2018.01.31 Fixed bug slow processing for version 1.41. 2018.01.28 Fixed bug slow processing when repeating loading. Recoil time displayed in 0.01 seconds in MCM. 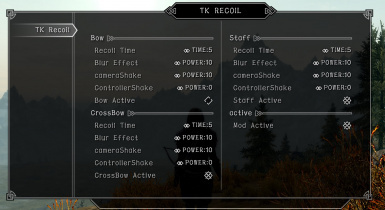 Default value changed: Activate Bow Effect is on, recoil time crossbow and staff: 0.1 -> 0.08. 2014.12.05 Fixed bugs disable the function when the player back from Werewolf and vampire lord. More solid and faster response. Apply recoil while slow time. 2013.03.05 When player loads anew bolt on crossbow applies effect bug fixed. Default bow value to half reduced. This makes weapon recoil feel more solid and heightens the sense that a hit has actually been made. This mod is not add motion. Previous versions of this mod used a spell to bring up the customization menu. This has now been replaced with the MCM menu. You can customize each value of each weapon independently. Recoil Time: Simulates a pause in the movement of the player and the enemy. 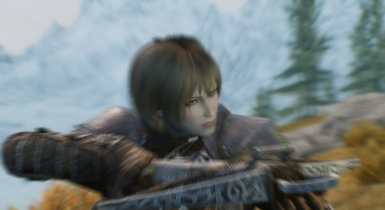 Blur Effect: Applies a radial blur to the player's camera. Shake Camera: Shakes the player's camera. Shake Controller: Vibrates the controller. Default: Off. Active: Toggle this option to apply effect. Don't forget to activate the TKRecoil.esp file in your mod launcher by checking its box. *This mod has shared some files TK Hitstop. Be careful when uninstalling. If this mod does not work correctly, please save a game and then load it again. For the ultimate combat experience, why not combine TKRecoil with some of my other mods? TK HitStop: Adds a solid feel to weapon strikes and an effect to confirm the hit. Ultimate Dragons: Overhauls dragon combat. Adds new animations and behaviors. Ultimate Combat: Overhauls combat. Adds new animations and behaviors for NPC. TK Dodge: Adds dodge animations for the player. Use the in-game Mod Configuration Menu first to deactivate the mod in-game before deleting it. Then save, quit the game and delete the files listed above under “Installation”. I was wondering if you could translate an English text of MCM into your language. A google spreadsheet can be edited by anyone. I cannot accept donations by Paypal in my country. It is possible for patreon or ko-fi.